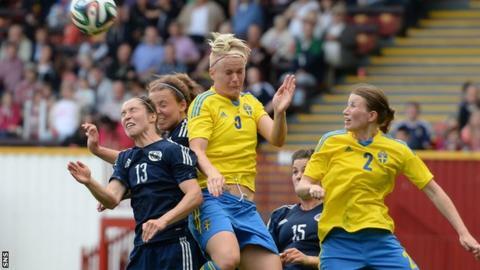 Scotland missed out on automatic qualification for the 2015 Women's World Cup after losing 2-0 to Sweden. An early headed finish from Therese Sjogran gave Pia Sundhage's team the lead. And, despite the visitors coming close through Kim Little and Jenny Beattie, a Lotta Schelin strike sealed top spot in Group Four for the hosts. Scotland will now contest the play-offs with Italy, Ukraine and Netherlands, their possible opponents. The sides went into this match with the Swedes three points clear at the top of the table, courtesy of their 3-1 triumph over the Scots at Fir Park in June. Following a 9-0 thrashing of Faroe Islands, Anna Signeul's Scotland made history by clinching a play-off place for the first time, but their hope of claiming the automatic qualifying spot was still alive. A 3-1 win or better was required to secure automatic qualification for the finals in Canada but, despite making early strides through the likes of Caroline Weir and Little, they had the wind knocked out of their sails when slack defending cost them dearly. After good build-up play, Schelin - her country's top scorer of the campaign so far - played an inviting ball into the box that Sjogran headed past goalkeeper Gemma Fay. The hosts were playing with intent, and were very nearly two up when Sjogran found some space, but her effort whistled wide of the post. Signeul's players gradually started to threaten, and could have equalised when Jane Ross connected with a Little set-piece, but her header was straight at goalkeeper Hedvig Lindahl. The home side must have thought they had doubled their advantage when Schelin found herself clean through and rounded Fay, but her attempt from the angle struck the post. As the Swedes swarmed forward, there was another close call thanks to the creativity of Schelin, who freed herself and got a shot away, but a combination of Beattie and Fay saw off the threat. The second goal looked a certainty when Elin Rubensson charged to the byline and fired the ball across goal to Schelin, but the 30-year-old was denied by an outstanding point-blank stop by Fay. The second period began with Sweden still in the ascendancy. But Scotland soon found their feet and, following excellent work by Hayley Lauder and Little, Leanne Crichton pulled the trigger from distance and drew a save from Lindahl. The chances kept coming and it was Little at the heart again, as she twisted and turned and sent in a looping strike that looked goalbound, only for Lindahl to tip it over. When Beattie had a header cleared off the line by Caroline Seger, it looked like the leveller was coming. Next to try her luck was Crichton, who met a teasing delivery from Jo Love but saw her powerful header saved by the goalkeeper. And, when Lauder stung the palms of Lindahl with a powerful free-kick, it brought more hope for Signeul's charges. But that was soon extinguished when the busy Schelin, after latching on to a perfect through pass, kept her cool and slotted home, putting the result beyond doubt.